Counseling clients on various litigation issues including pension, profit sharing, 401(k), ESOP, life insurance, long- and short-term disability, medical expense reimbursement, health care, and severance. Since 1974, when Congress enacted the Employee Retirement Income Security Act of 1974 (commonly known as ERISA), Calfee lawyers have counseled clients regarding various related litigation issues. Because ERISA governs myriad types of employee benefit plans including pension, profit sharing, 401(k), ESOP, life insurance, long- and short-term disability, medical expense reimbursement, health care, and severance, our lawyers’ experiences in this regard are diverse. We have represented plan sponsors and administrators, third-party administrators, claims administrators, plan fiduciaries, trustees, participants, beneficiaries and non-fiduciary plan service providers in connection with ERISA litigation matters. Our services have included the prosecution and defense of claims for breach of ERISA fiduciary duties, benefit denial claims, prohibited transaction claims, subrogation claims and ERISA Section 510 discrimination claims. We have handled ERISA matters in federal and state courts. We also have counseled clients with respect to Department of Labor investigations and Internal Revenue Service proceedings relating to ERISA. We also have advised clients with respect to litigation trends associated with ERISA-related issues, including monitoring plan investments and fees as well as litigation risks arising out of ESOP transactions. Given ERISA’s comprehensive and constantly evolving nature, it is often unclear whether and how ERISA applies to a particular situation. Because the rules and procedures applicable to litigation under ERISA frequently differ from those applicable to non-ERISA litigation (and many times in an advantageous way for a plan sponsor or fiduciary), it is important for any business or person that is involved with an employee benefit plan to understand ERISA’s scope and effect. 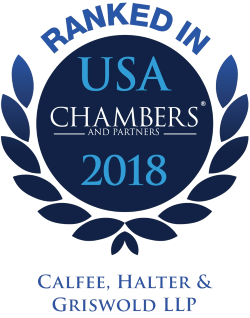 Calfee was selected for inclusion to "Best Law Firms" for ERISA Litigation and Employee Benefits (ERISA) Law (National Tier 3) by U.S.News–Best Lawyers in America 2019. In 2013, while representing the public company employer, obtained a federal court preliminary injunction freezing the current and prospective assets of all four adverse parties in a multi-million-dollar ERISA healthcare benefits dispute arising from the mismanagement and underfunding of welfare plans. Following extensive fact and expert discovery and summary judgment briefing before the District Court for the Eastern District of Michigan, favorably settled, in 2011, ERISA fiduciary duty and prohibited transaction claims filed by the bankruptcy trustee on behalf of an insolvent public company against its former officers and directors. In 2010, following oral argument, obtained affirmation from the Sixth Circuit Court of Appeals of a summary judgment award in an ERISA case involving Plan Administrator discretion, the appropriate standard of appellate review and the interplay between written Plan terms and alleged conflicting oral representations. In 2009, finalized a $27 million settlement against an international financial adviser arising out of the Calfee pension plan client’s losses due to investments made in Bernard Madoff-related funds. In 2009, on cross-motions for summary judgment filed after three days of evidentiary hearing, successfully limited an ERISA plaintiff to a small fraction of his sought-after $9 million in damages and attorneys’ fees arising from the administration of a Supplemental Executive Retirement Plan. In 2008, appeared in Dayton federal court for a class-action fairness hearing and reached an agreement to settle on favorable terms ERISA and RICO class-action claims arising from pension plan consulting and actuarial services. Arguing ERISA preemption and standing issues before the Fifth Circuit Court of Appeals in 2005, obtained judgment affirming the Louisiana district court’s summary judgment on behalf of three clients. The companies had been sued in Louisiana state court for $2.4 million, arising from their alleged violations of Louisiana’s bad faith insurance statute. In 2005, obtained an American Arbitration Association award on behalf of Ohio’s largest Medicaid healthcare provider following state court litigation and a multi-day arbitration hearing arising from Medicaid billing fraud and breach of contract allegations against the client.